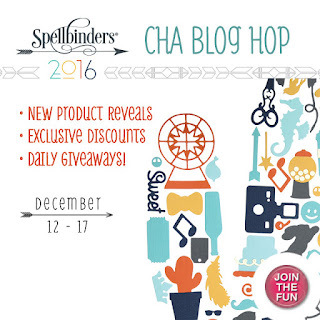 Welcome to the Spellbinders 2016 CHA Roundup Blog Hop Day 4! Today I have two cards to share with you using some of the GORGEOUS new dies! My first card uses the beautiful Fairmont Labels. I love this label shape. The details are subtle, but add a lot at the same time! I layered two die cut labels with gold and white cardstock. I used distress inks to create a watercolored stamped tree and added a simple star sequin to finish it off. For my second card, I used the World View die. This is one of my favorites! I am going to have so much fun with this one! The embossed continents are fabulous! You can find more AMAZING inspiration today over at Donna Salazar Designs. Yup. You read that, right... THE Donna Salazar! YAY!!! There are AWESOME Giveaways all week, too! To win the dies being featured today visit both blogs and complete the OFFICIAL ENTRY FORM for your chance to win. Of course, we love to read your comments, too! Find the full contest details HERE and the official rules HERE. 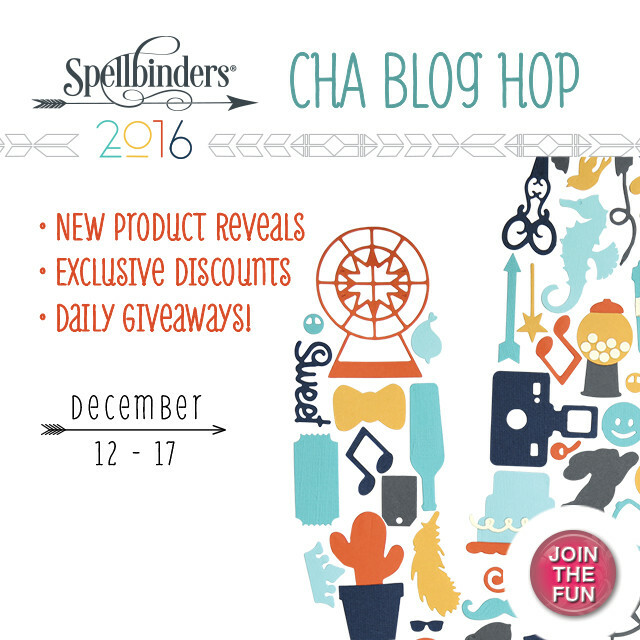 If you have any questions about the contest, email Spellbinders at ContestQuestions@Spellbinders.us. Great cards Jennifer. I am for sure going to be using World View too! Jennifer, the globe is cool and the Fairmont labels is great. Love all the labels that Spellbinders has brought out. Thanks for sharing your cool projects. Thanks for sharing your creations.. good job! 2 great cards here Jennifer, and both very useful. I too am pretty hooked on the world die and love the embossed parts on it. You did a great job on these. ADORE your GORGEOUS Christmas card, the Fairmont Labels are SO ELEGANT!!! SORRY to disturb you Jennifer, but I just tried to enter the giveaway (Thank You for the chance to win) and saw that it has Loretta's name on it and was wondering if it is the correct link? Each of the links have had the name of the person whose blog it was linked ... sure hope it is OK, I really, really want my entry to count for this AWESOME giveaway, keeping my fingers & toes crossed! I really love your use of the WORLD VIEW dies. This set will be so versatile. Love the embossing sections. Can't wait to get my hands on it. Great cards! Love the world view die. Great for tons of different cards! Fantastic cards Jennifer. Looking forward to both sets. Love the world of thanks card!!! Great new dies. Lots of ideas running through my head. Mainly manly cards but other uses also. Your cards are Fab!!! Love love the World View die! Very versital !!! Awesome cards. I'm with you, I'm loving the World view; too! Thanks for sharing your creative talents with us. The wheels are turning on how many ways these items can be used. I love the patterned paper behind the world globe. the shading is a great idea. the die is wonderful - very different and pretty. Thank you for the lovely cards. Both have a unique style and make the new products shine. Great cards! Love those labels and the world globe is awesome! Beautiful cards!! I LOVELOVELOVE the Fairmont Labels and the Globe is going to bea fun one for my grandson and I to do a few projects!!! TFS! Beautiful cards and die sets. First, Jennifer, I love your "about me" content! You must be a stitch to be around. I love the Fairmont Labels and the Globe, and your projects are striking. Gee, this blog hop is introducing me to so many wonderful crafting products. I thank you for being a part of the Blog Hop! Beautiful cards! I like the shape of the labels and the globe looks great! This is a unique card using the globe and the labels card is awesome. Thanks for sharing. 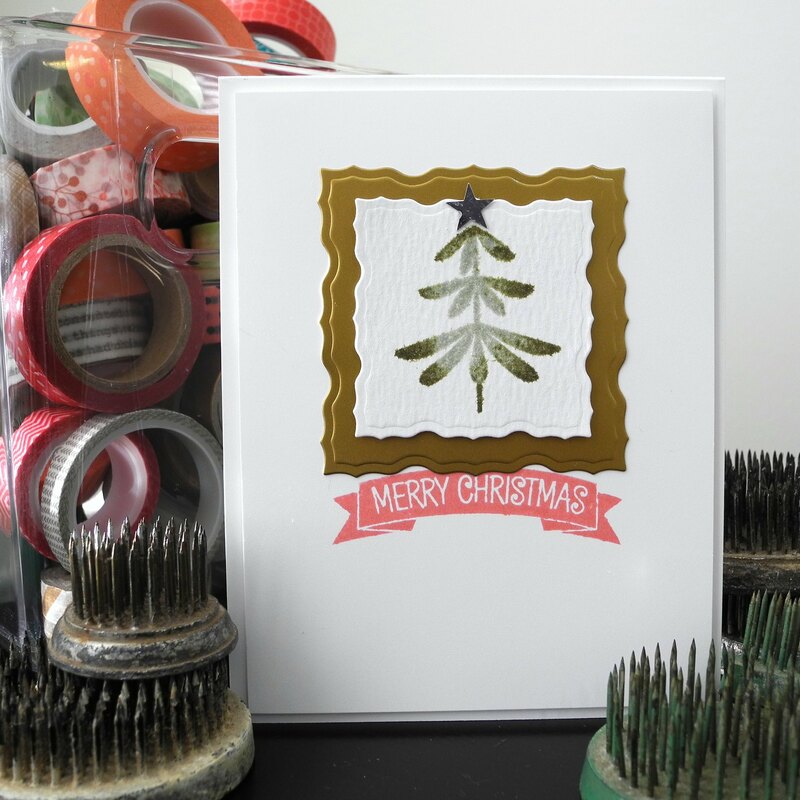 Great cards, I love the little Christmas tree stamp! Love the labels, they look like just the right size for cards. Thank you Jennifer! These cards are just beautiful! Love this release! ok that globe is just too cool! Love them both! Beautiful cards! Loving all the new releases. lOVE YOUR CARDS JENNIFER!! tfs!!! Hi Jennifer, I love the shape of the new labels dies and the world view is fabulous, I can see lots of uses for this gorgeous die. Thank you for the inspiration. I just love your card using the World View Die, it's beautifully created and so awesome. My son just asked Santa today for a full sized globe for Christmas and than I see your card using this one, thinking I need to acquire it. I just love the World View and Label, both are perfect for making countless projects. Lovely cards! Love your new label shape too!!! Love the cards, and the new dies are great. The label is lovely, enough shape to give it real class. You cards look great too. Love the cards and the way you have used the dies. Love the globe and that fabulous background paper! Dazzling! Love your cards. The dies are awesome. what a great dies and wonderful cards !!! thanks for sharing ! The Christmas card is fabulous, and the Globe thank you is gorgeous. Love your cards. Can't wait to give it a try. So many great ideas. These are great die sets! The labels are so perfect, and the globe die - well, I just don't usually like globe dies, but this one is enough different to make me sit up and take notice! I'd actually enjoy using this one, so it went on my wish list - which is waaaay bigger than my wallet! Thanks for sharing your inspiration with us! Great shape for the Fairmont dies....great inspiration! I can see so many uses for the Fairmont Labels. Those are going on my list for sure. That globe is adorable! I love maps and things like that. I can see some great journal pages with this die. Wow!!! It just keeps getting better. I wish Santa would bring me a larger house or better yet my own studio filled with all the new Spellbinders dies. Fun times ahead. Awesome cards! Love the new dies. I love your world card.I can't wait to purchase these dies. Great cards. Love the world die! Thanks for sharing and thanks for the chance to win some awesome dies. Jennifer, both cards are outstanding. The label dies are becoming more elegant which is my style and the new world globe is another favorite. What a fun 2016 we will have! I am with you on the World View die. I really like your how you used it on your card-great inspiration. Thank you! Love the globe!The world card is great and I can't wait to get the Fairmont labels. Thank you for these wonderful dies. Really like both sets, Jennifer, but my heart is being tugged to the World View die. In these days, it really puts a different perspective on how small the world really is for all the different peoples in it, doesn't it! Thank you for your take on using this particular die ... Beautiful! Love the label die in card one. Love both cards. Looking forward to purchasing both die sets! Such wonderful projects. I could see a lot of these being used in multiple ways. Thanks for sharing. I love both cards. The globe is fantastic. I love the World View Die and how you used it. These are what i would love to have, just beautiful...Also pretty cards you made to share.. Terrific cards. Love the Fairmont Labels and the World View dies. Definitely adding them to my with list. Thank you or sharing! These dies are so fun and your cards are precious!! Love the Fairmont Dies. These are a must have! I had searched for a World and now I have found one. Thanks for the new dies and projects. Lovely. I didn't think the Fairmont Dies were that great until I saw your card, AWESOME! Hello Jingle, loving the new die's and your projects thanks for sharing..
Nice cards Jennifer. I like what you did with the globe and sanding it on the edges. I love different shaped labels and the Fairmont label is elegant and fancy, a great one to add to my dies. The world view is a die that will be so fun to use on cards. congrats on your new dies! Great cards and dies Jennifer. Beautiful cards and dies! Love the Fairmont christmas tree one! Thank You for sharing them! What wonderful card . Thank you for the ideas! REALLY like the Fairmont dies. I see lots of potential for them! Beautiful cards. Both dies are quite lovely. Two lovely cards and two sets of lovely, very useful, dies! Thanks for showing us your ideas of how to use them. Thanks for sharing the new dies. I like the Fairmont shape too. Nice cards Jennifer! I like the globe card especially! Thanks for sharing your work! I love the globe and labels. So many possibilities.